By popular demand, I am excited to share highlighting & contouring makeup tips! 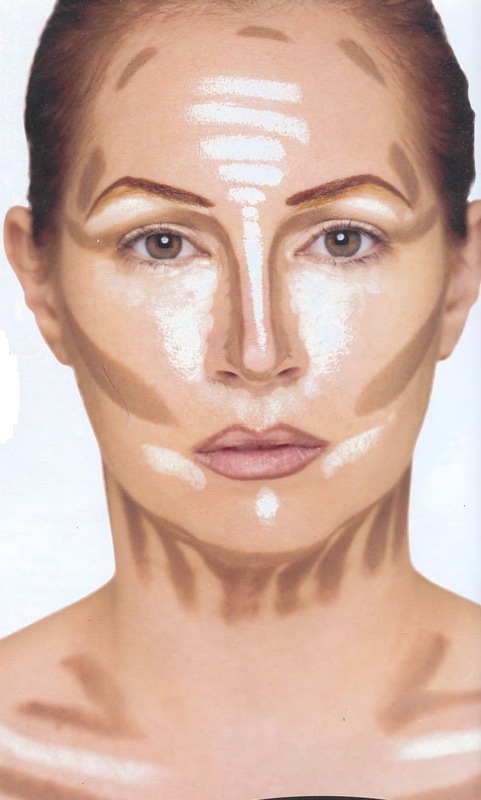 Contouring and highlighting are one of the makeup techniques that every makeup addict should master. They can totally transform your face by playing up your features and downplaying your flaws and they usually go hand in hand. In fact, by using the right contouring makeup tricks you can create the illusion of a slender nose, killer cheekbones, slim jawline etc. I saw this image suggesting how to apply your products for highlighting and contouring and thought it would be perfect for sharing. I really love this one as it makes a great easy-to-follow guideline for practising and trying this technique on yourself! * To contour, you will need a color that is one to two shades darker than your foundation. You can use a brown eyeshadow, bronzer or a darker foundation. * To highlight, you will need a color that is one to two shades lighter than your foundation. You can use a shimmery white/beige eyeshadow, a lighter foundation or a highlighter. *TIP: On a daily basis when working for a natural daytime look, I love pressed powders. For an evening look and for replicating the above demo, I would use cream foundations. They give fabulous coverage and will blend seamlessly. If preferred, just mix the cream foundation with a bit of moisturizer for a more sheer to light coverage. Apply product of your choice by following the outline in the above image and then blend the lines by gently pressing the colour into your skin. You can use your fingers, a brush or a sponge but I would recommend a sponge for best results. When finished, take a step back and make sure there are no harsh edges. Also be careful not to blend the different colors together. I suggest you start out with a little bit of product at a time as it's always easier to add more colour as needed until you find what works perfectly for you. Hope this helps and best of luck! If there is something I didn't cover here that you want to know or you'd love to share your thoughts- please comment on this blog post! I absolutely love hearing from my readers! Lastly... care to know all about the makeup products I can't live without!? I am going to dish those juicy details in my next blog post. You won't want to miss it!